This issue, more than any other we've published, raises the awkward matter of forced conversions—"Be Christian or die.” There’s no sense in pretending this was an exceptional missionary tactic; for many centuries, it was the method of choice among Christian rulers and missionaries. The conversion of much of Europe and of Latin America is unimaginable without the sword. It is not a pleasant aspect of our heritage, but one that nonetheless teaches us a great deal about human nature and what, in fact, solidifies Christian faith. To explore this topic, Christian History spoke with Richard Fletcher, history professor at the University of York, England. 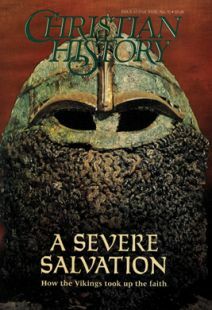 Professor Fletcher has spent a lot of time researching medieval Europe, the era when forced conversions were the rule, and his The Barbarian Conversion: From Paganism to Christianity (Henry Holt, 1997) is one of the splendid results. When did Christians first begin to use force to convert people? Soon after the conversion of the Roman emperor Constantine, though the first use of force was not designed to convert pagans but to correct dissident Christians. Augustine, the great bishop of Hippo in North Africa in the late fourth and early fifth century, was faced with a dissident sect, the Donatists. Augustine wanted to bring them back in the orthodox fold, and he agonized about whether it was permissible to use coercion to do so. It isn’t until the Frankish kingdom of Charlemagne in the eighth century that we see force used to coerce conversions, specifically in the campaign against the Saxons. Why did Charlemagne move in this direction? First, the concept of Christian kingship had developed the previous century, and the duty of expanding Christendom, if necessary by force, became part of a king’s duty. It’s partly based on an Old Testament model of kingship. This policy of using violence to motivate conversion in Saxony was not supported by all the king’s advisers. Another Englishman at Charlemagne’s court, Alcuin, had grave doubts. In the 790s, when the Franks conquered the Avars on the eastern frontier (in modern Hungary), Alcuin wrote letters to Charlemagne, saying essentially, “Don’t make the same mistakes you made with the Saxons. You can’t force Christianity upon people.” There are some signs that Alcuin’s advice was heeded; the proposals to convert the Avars by force were slightly toned down. But by the 1300s, no one objects anymore. The chronicles of the Viking kings, for example, laud them for using the sword to convert pagans. What happened in medieval Europe to solidify this view? Robert Moore, author of The Rise of the Persecuting Society, argues that from the eleventh to the fourteenth century, European Christian society became much less tolerant. This is the era when we see persecution of Jews and heretics, crusades against Muslims, and the increasing acceptance of forcible conversion—especially in the only area of Europe that remained unconverted: Scandinavia and the Baltic region. I don’t agree with Moore’s argument in all respects, but more people were being persecuted in Europe in 1250 than were in the Europe of 1050. That’s a fact. One can’t get away from it. Is this a product of Christian theology—an insistence on Jesus Christ as the truth—or of political strength—Christians finally have the military force to insist on their way? Both. On the theological side, there is an unprecedented emphasis upon the humanity of Jesus Christ, especially upon his sufferings. Coming closely behind is a feeling of enmity toward those who were identified as his persecutors, especially the Jews, and by extension, all those who were perceived as not fully Christian. Though Christians lived peaceably with Muslims in the Holy Land for centuries, during this era, Muslims become identified as the enemies of Christ who must be booted out of the Christian holy places. Yet we should also emphasize the sheer power of Western Christendom, which blossoms during this time. There is an upsurge in technology, in military organization, in state power, in the ability to raise taxes and hire armies. This put Western European states at a decisive advantage over the remaining pagans in the Baltic, for example. Given the climate of intolerance, it’s irresistible to use the power at your disposal to clobber pagans and make them Christian. Yes and no. The problem is semantic. The definition of conversion has changed over the centuries. Today, we don’t regard that as conversion—nor would some early medieval people, like the Venerable Bede (c.673–735) or Alcuin (c.740–804). They wouldn’t have thought people converted until they were taught the creeds, Christian morality, and the like—which may take two, three, or four generations. Nonetheless, because of the initiative of coercive kings, Christianization was now possible in a way it hadn’t been possible before. In the end, medieval pagans seemed more willing to submit to forced conversions than Christians under similar circumstances. Why is that? The common factor in paganism all over medieval Europe was polytheism. Pagans had lots and lots of gods—gods of weather, of harvest, of the sea, of the sky, of beer making, of battle, and so on. Anthropologists who've studied conversion in polytheistic culture in Africa, for example, have found that such peoples think they can just add Christ to their existing pantheon. This is what seems to have happened in medieval Europe. The exclusive claims of a monotheistic faith didn’t sink in at first. That’s why even after “conversion,” we find a long period in which ideas about gods and goddesses, spirits and fairies, elves and goblins coexist with faith in Christ. Another reason was that pagans were impressed with the sheer material power of Christendom. Paganism was a faith that was largely geared to gaining material prosperity. There were gods for the crops because they wanted their crops to grow. They had gods for cattle so that they would produce more milk. When these pagans looked at the wealth and power of Christian Europe, they were impressed: the Christian God was obviously one who could deliver the goods. Christians built bigger buildings, made more beautiful jewelry, possessed better ships, and so on. Many pagans were not adverse to converting to Christianity because they believed it would, in fact, give them more material prosperity than had their gods. To appreciate this point, note how Christian missionaries fared in sixteenth-century China. Here was a non-Christian culture that was in many ways superior to the West. In that context, Christianity makes practically no headway. In Europe, we see evidence that this wasn’t a by-product but a deliberate tactic of missionaries. When the bishop of Winchester sent his pupil Boniface to evangelize Germany, he stressed that Boniface should remind the pagans just how rich and powerful the Christians were. Were there any cases in which forced conversion didn’t work? Yes. With pagan polytheists, I don’t think there were any failures. But with the monotheists—Jews and Muslims—coercion had little success. They understood it wasn’t a matter of adding a new god but choosing a different one. They also come out of cultures that were sophisticated in their own right. Though the first generations converted for less-than-pure motives, in subsequent generations, Christianity seems to “stick.” That is, as the centuries unfold, these formerly pagan societies sincerely adopt Christianity. Why is that? One significant reason is the Christian teaching that took place after the formal acceptance of Christianity. It’s easy to point out the many abuses of the medieval church, even in what it taught. On the other hand, it did an awful good job at instilling knowledge of Christianity into people who had been pagan for centuries. One good example of this is seen in Anglo-Saxon England. The Venerable Bede, in his Ecclesiastical History of the English People, tells the story of King Edwin, who had embraced Christianity primarily because he thought he would become a great and powerful king as a result. And Bede says, in fact, he did. But he also noted that Edwin was, and always had been, a thoughtful man who would sit by himself hour after hour pondering the deep mysteries of life. Before he had become a king, in fact, he had a vision in the middle of the night, in which a mysterious stranger said to him, “I will tell you about a God who brings salvation.” Later on, after Edwin had become king and was growing in power, he ran into a missionary who was this same mysterious stranger whom he’d had seen in his vision years earlier. There was in Edwin a desire for salvation, and he felt that beyond the wealth and power Christianity gave him, it also helped him settle this issue in his own heart and mind. For Bede, this seems to illustrate the need for Christian teaching—to instruct especially rulers and the elite on the meaning of Christianity, of salvation, and other key theological concepts. Today using force to convert is unthinkable. Why did this idea, that was used for centuries, pass away? A couple disclaimers: this is an immensely complex topic, and I'm not an expert on post-medieval missionary history. That being said, my hunch is that it’s largely due to the rise of Protestant evangelical movements, especially the Great Awakening. Here we see a new stress placed upon the individual soul and upon religious experience. Conversion becomes a voluntary, individual turning to God. Once you have that understanding, the idea of forcing someone to convert becomes absurd. Resources for further study of the Vikings. Spiritual Wisdom of the Desert Fathers. Antony and the Desert Fathers: From the Editors — Models or Kooks? The questions that hover in the background of this issue are as pressing as ever. The stories of desert fathers’ skirmishes with demons pointed to a larger struggle—and victory.